S5 SM-G900V Verizon, S5 SMG900P, S5 SM-G900 and Galaxy S5 i9600. Compatible with: Samsung Galaxy S5 Active SM-G870, S5 SM-G900A AT&T. Waterproof OEM Samsung Galaxy S5 Back cover. High Quality, Test Before Shipping, NY Fast Ship. Samsung Galaxy S5. •OEMBack Door - BEST QUALITY AVAILABLE. WITH LOGO OEM. - Ready to go! Extra Information. Samsung LED Wallet Cover Case For Samsung Galaxy Note 8 Black - Authentic !!! If there is anything you are unsatisfied with. 4.5 out of 5 stars - Samsung LED Wallet Cover Case For Samsung Galaxy Note 8 Black - Authentic !!! 14 product ratings14 product ratings - Samsung LED Wallet Cover Case For Samsung Galaxy Note 8 Black - Authentic !!! Excellent: The item is in excellent condition. There are no scratches or blemishes. To ensure functionality and reliability, the item has been tested and is 100% fully functional. The item is in the original box but not sealed. You are buying a Samsung Galaxy S8 S-View Flip Cover with Kickstand - Blue - NEW OPEN BOX. Case will fit Galaxy S8. Galaxy S7 Case MADE OF - TPU and Polycarbonate material Designed Specifically for Samsung Galaxy s7 shock absorbing shatterproof premium. For Samsung Galaxy S7. SLIM DESIGN - Super-slim design and perfect fit that adds minimal bulk to your smart phone You will love this s7 case because of its clear case maintaining the beauty of the device, and its slim body. Original Samsung Galaxy S10 Plus Canvas Leather Case Cloth Fabric Finish Back. Condition is New. 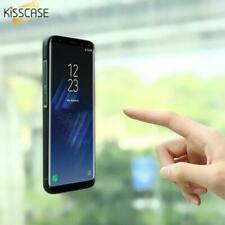 You are buying a Samsung S-View Flip Cover with Kickstand for Galaxy Note 8 - Blue - NEW OPEN BOX. Case will fit Galaxy Note 8. Compatible with: Samsung Galaxy Note8. The Samsung clear protective Cover is an easy-to-hold, durable case that protects your phone Without sacrificing style. It combines edge to edge plastic protection with minimal bulkiness to Show off your sense of style. For Samsung Galaxy S-10 Plus only. 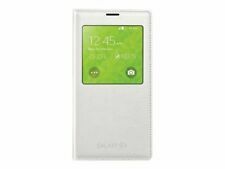 S-View Flip Cover enables you to see and interact with your phone screen through the front of the case. With a built-in kickstand to prop the phone up, you can show off the full screen whether your cover is open or closed. Kate Spade Samsung Hard Shell Case Cover. Premium signature kate spade new york graphic prints and colors. For Samsung Galaxy S6 (Silver Glitter/Navy Blue). Glossy finish enhances the overall style and creates a sleek look and feel. Phone cases are designed to help guard your mobile device against scratches and impact. 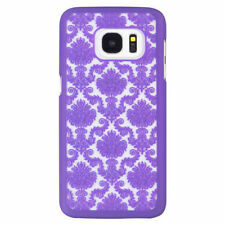 Many phone covers not only protect your Samsung Galaxy but also complement your lifestyle. From colorful military-grade rubber to soft suede-like materials, Samsung's fashionable accessories are designed to fit the needs of various phone users. What materials are used to make Samsung Galaxy phone cases? Silicone: This thick, gel-like substance absorbs shocks and protects your Galaxy mobile device from low-impact drops. They are available in both clear and bold colors. Polyurethane: Available in soft and hard plastic, Galaxy polyurethane cases are durable and provide protection. Polycarbonate: This plastic material is made from the same material used to make bulletproof glass. Military-grade rubber: A rubberized texture protects your Galaxy mobile device from shocks and bumps. Some phone cases have been drop tested from heights of 6 feet. These also offer 360-degree protection. Alacantra: Alacantra is a suede-like, stain-resistant material. What type of phone case will fit your Samsung phone? Samsung accessories are precision cut to fit specific models. This way, users have full access to buttons and ports. It does not matter if you own a Galaxy Edge, Galaxy Note, or Galaxy 8; you will find an exact fit. Check the model number and pick a case that suits your daily use. Samsung Galaxy Shell Cases: Typically made of hard plastic, these sturdy covers snap on the back of your phone, leaving the front of the phone free for quick access. Choose from clear or vivid colors. Samsung Galaxy Clips: Phone cover clips allow you to slip your phone over a belt, leaving your hands free. Samsung Galaxy Kickstands: Phone cases with kickstands feature a fold-out piece in the back to hold the phone up, allowing you to watch videos and multitask. Samsung Galaxy Wallet/Flip Cases: The cases have covers on both sides, providing a high level of protection. These accessories are made of genuine or synthetic leather. The front cover opens for easy access, and some phone cases also have slots where you can store cash and credit cards. 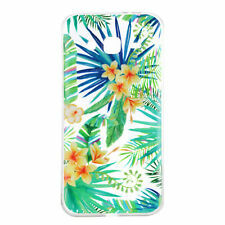 Samsung Galaxy Skins: A tight cover surrounds the back of the phone, offering an easy grip. You will find clear or translucent colors as well as scenic designs.